"Some took the opportunity to change their name." "Those name changes have made it very difficult for the scholars to follow your tracks." "That's exactly why it was done." "But why did they do that?" "Some out of fear from deserting the Foreign Legion, some of us were afraid that our families would suffer reprisals if we fell into German hands." "Wait...! Miguel Campos? Then what my historian friend suspected is true. You... you're a legendary member of La Nueve." 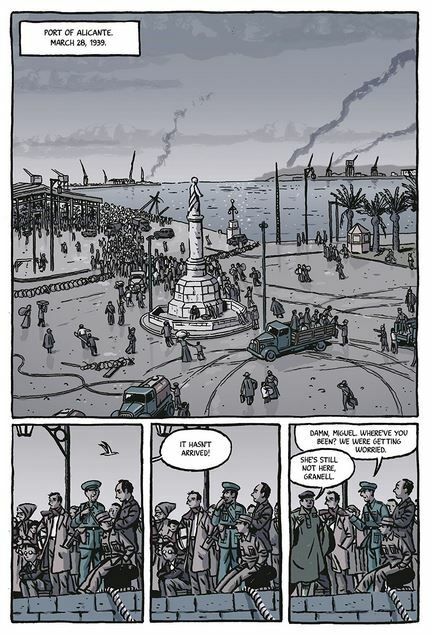 "Eisner-award winner Paco Roca (Wrinkles) reconstructs World War II through the memories of Miguel Ruiz, a member of 'La Nueve,' a company of men that went from fighting against the Franco regime in the Spanish Civil War to battles across Europe and Africa, spurred on by their patriotism and hate for brutal dictatorships. Ruiz's stories are filled with horror and humour but Twists of Fate is much more than a forgotten hero's personal story. It's a timely look into what we remember and why we forget, a reminder that everyone has a tale to tell, and an ode to a generation that stood up to, and beat back, violent fascism." I was utterly gripped, dear reader, for Spaniard Miguel Ruiz aka Miguel Campos was indeed a true war hero. 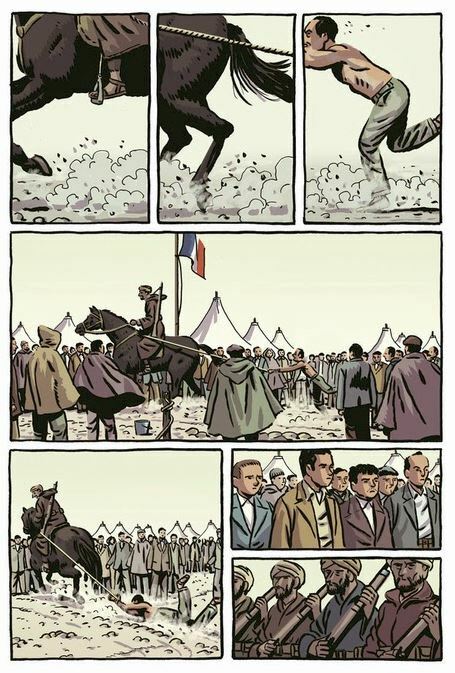 The fact that he managed to somehow disappear entirely at the conclusion of hostilities and live a very quiet life in France is another story entirely. Paco Roca, having managed to track him down through some determined detective work, regales us with both. 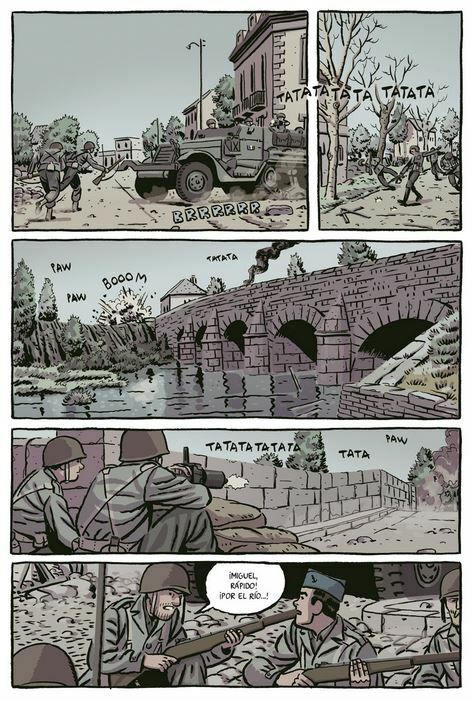 This is simply one of the finest 'war story' works I have ever read. We see Paco gently interviewing the initially very reluctant Miguel daily over a number of weeks, conversing patiently with him, gradually teasing his remarkable reminiscences out of him. 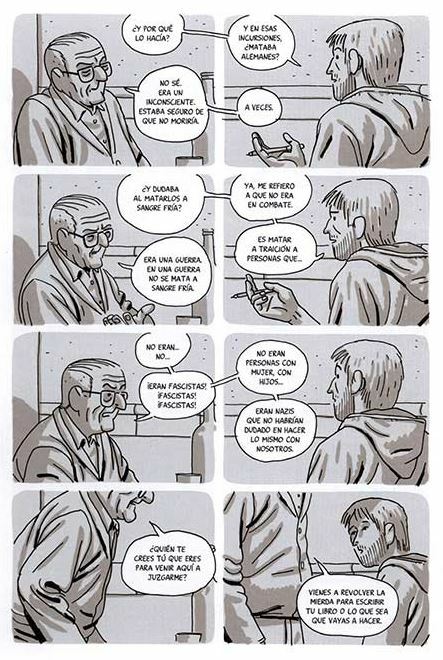 During those sessions Paco frequently puts us into the first person perspective of Miguel, allowing us to see through his eyes, which ensures that the reader is fully transported back to those dark, tumultuous days. Of course for the men who had been unsuccessfully fighting Franco's fascist rule in Spain during their civil war that ran from 1936 to 1939, those days started earlier than for most in Western Europe. 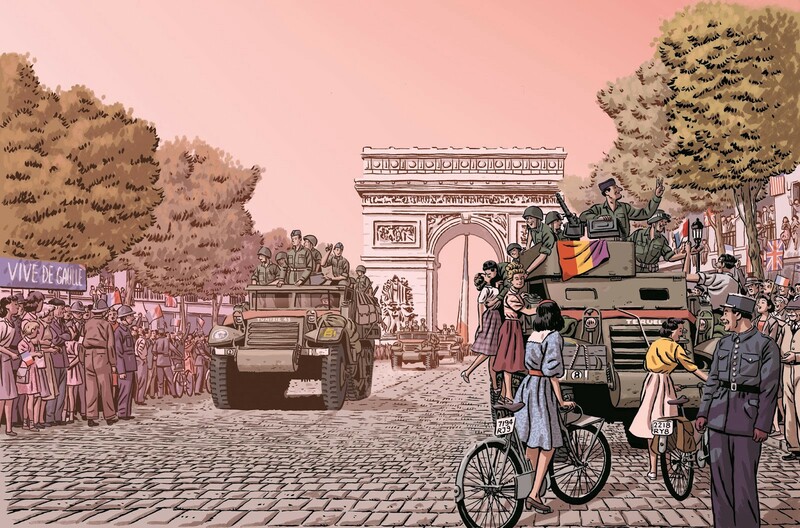 We see Miguel's own personal odyssey and also the similar sad stories of a group of very brave individuals who longed to believe that once the Axis powers were dealt with, the Allies would then turn their attention squarely upon the fascist Franco and help them liberate Spain. We see their war, beginning with being outcast and exiled from their homeland, then unwanted and unwelcome in Vichy France and its territories, so having their refugee status promptly revoked and effectively made prisoners of war, toiling as slave labour in coal mines and railroads in the burning heat of Saharan Africa. Eventually they were freed by the advancing Allies, before mostly deciding to join up with the Free Corps of Africa French forces along with deserters from the then Vichy controlled French Foreign Legion and head to mainland France as liberators, indeed ending up as part of the very first group arriving in Paris itself. Of course, after overthrowing the Nazis, the Allies decided to let Franco stay in power, being willing to accept Spain's politically 'neutral' position during WW2 as reason to do so, despite Franco letting the German and Italian navies use Spanish ports and various other low grade support for the Axis powers, presumably out of fear that Hitler would prove victorious. To Miguel and his friends, though, it felt like an unforgiveable betrayal. Some former La Nueve fighters tried to start an insurrection, but following one particularly brutal, haunting, personal loss, Miguel decided that enough was enough, his war was over. Until Paco tracked him down and stirred it all up again... Ultimately, though, Miguel was very glad he did. As, of course, so should we be. So the sacrifices these exceptional people made for our freedom are never forgotten. Plus in this case, the long overdue recognition due to one particularly unassuming individual be made public in this exceptional graphic memoir.